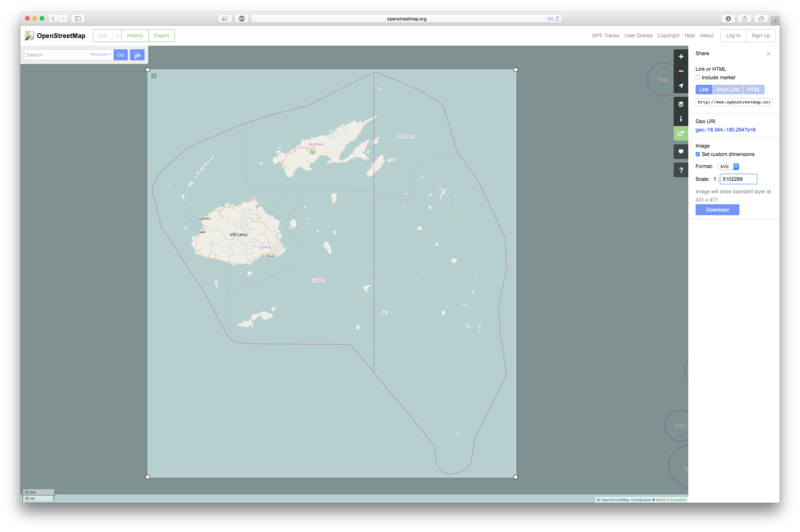 I'm trying to export an image (ideally an SVG) of the entire Fiji region - which is quite large. Whenever I go to export the map, it's cropped to a smaller region than what I've selected. I've tried other formats, scales and regions, but it seems to be unable to export the whole area. Are there any fixes or alternate ways of getting the full region? I suspect you are seeing the problem because the area you select is spanning the 180° meridian. I would suggest, as a workaround, exporting two images, one for the area in the western hemisphere, and one for the part of Fiji in the eastern hemisphere. There is likely a bug either in the area-selection code, or in the image export, that causes this. Thanks - good suggestion, but the bug seems to break the area directly adjacent to the meridian, giving me Invalid Bounding Box or server areas. In fact it's almost impossible to export the part of Fiji east of the line. I am not sure whether that "error" also occurs in other OSM based tools. So have a look at OSM_on_Paper or SVG in the OSM wiki and tell us about success or failure. I tried Mapbox earlier which had the same problem - but I'll give these a shot too, thanks.